13.3 x 8.8 x 8.4 cm. Large, mirror-bright, brass-yellow pyrite pyritohedrons form an impressive and excellent cabinet specimen from the famous Alimon Mine at Huaron, Peru. 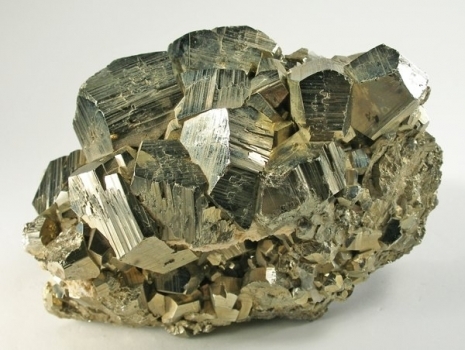 The pyrites are beautifully striated and the large crystal is 4.5 x 4.0 x 3.5 cm. The cluster, overall, is in very good condition. Pyritohedrons are very uncommon from Huaron, as most are cubes. This is one of the finer specimens with large crystals that I have seen from the Alimon Mine. Pieces of this quality came out in the mid-1980s. Weighs 4.2 pounds or 1.9 kilograms.